A few years ago I wrote a short story released by Torquire Press, after having seen Magnetic Fields' video Papa Was a Rodeo on a friend's website, where she said she wished someone would write a story for the song. Challenge accepted. It's not really a story of the song, merely inspired by the song. I had to do a lot of trimming to stay under the required 8,000 word limit the publisher had for "sips". After rights reverted to me, I was able to add in the stuff I'd wanted to the first time, and the word count swelled to 15,000. I was quite proud of that story, a departure from the norm for me, and it set the stage for writing anti-heroes. From my disillusioned rocker Killian Desmond came Lucky Lucklighter and the Diversion series. While the story certainly wasn't a best-seller, those who loved it loved it well, wanted more, and especially wanted to hear Mike's voice. For all of you, I've revisited this work. Highway Man is now a novel of over 60,000 words, has been polished, and is ready for my betas to read. With any luck I'll soon be releasing this story, dedicated to the fans who wanted more. Mike really grew on me. The story also contains several songs written by yours truly. The talented Darcy Stark has once again brought Lucky, Bo, and the others to wonderful life with his performance of Manipulation (Diversion 4). He really nails Lucky's personality, and I love how Bo sounds a certain way, but his voice is distinctly different when he channels alter-ego Cyrus Cooper. He traded trafficking for taking down criminals with the Southeastern Narcotics Bureau, and a drug-lord lover for a man on the right side of the law. Bo Schollenberger found the way past the thorny defenses of Lucky’s heart, and made Mr. I-Get-Along-Fine-Alone think about his and his closets, stevia in the sugar bowl, and a picket fence—with a good lock on the gate. Now Bo is missing, and a voice long silenced asks, “Did you miss me?” Lucky must deal with a devil from his past to get Bo back. And if Bo isn’t willing to come? A drug ring needs its back broken before flooding the US with a designer high, seductive and undetectable. But there’s a fine line between good and evil, and a truckload of temptation urging Lucky to cross. You can find the audiobook version exclusively on Audible here. 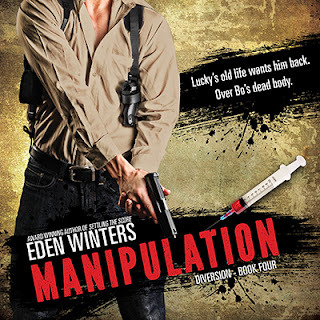 I've approved the audiobook file for Manipulation (Diversion Four). Darcy Stark is doing an excellent job of working his way through the series. I need to get to working on book eight, Decision, before he catches up to me! Now the book in quality control for ACX, which usually takes about two weeks, so look for Manipulation at Audible within the next week or so. I've finally finished the menage sci-fi, and since no better title occurred to me while writing, I named it The Cormorant, for their ship. The characters from The Sentinel were supposed to have cameos, but they wound up hanging around. So Connell and Stone fans, be prepared to see the guys again. Now blurb time. I always struggle with those. How much of the story is enough, how much too much? What drives readers to want to read, especially menage, which is not everyone's cup of tea? However, that's how the book turned out. Louis Quinton Van Orskey, or Van, has been in my head for years, and like Lucky in the Diversion books, he wouldn't shut up. And we saw what happened then. Tayn wasn't so clear in the beginning and, don't tell the other characters, but he grew to become my favorite. How can you not love a guy who exists in a ship's circuits? As for Jorvik, he started with a print I saw years ago on DeviantArt, called Tibetan Prince, with a somewhat haughty expression on his handsome face, decked out in jewels and finery. Circumstances show he's far more than meets the eye. I'll keep you posted on when to expect this work to appear, but now I'm diving back into writing two books at one time: Decision (Diversion 8), and Highway Man the novel.